As co-teachers, we get to come up with joint educational Halloween costumes! This school year, I’m adding a new role to my plate: Co-Teaching Facilitator! I’ll still be working as a 3rd grade teacher, but also hope to work with teacher teams and support them (and their collaboration). I’m very fortunate to work at a school where Lower School (K-5) Homeroom classrooms have co-teachers (and of course to have this opportunity to try out a new role without having to stop teaching!) and would like to support other teacher teams to utilize all the great opportunities that come along with co-teaching. Even if you don’t (or cannot) co-teach, collaborating with other teachers is so valuable for so many reasons! I find having another adult in the room is so valuable (not only because I can actually go to the bathroom if need be) in many ways, but especially in terms of making observations and gathering information about students. Two adults means you can get a second opinion, ask, “did you notice that as well?” and learn more about your students. It also means that our students learn from two different people's experiences when we have honest conversations about the world and that we have more flexibility to innovate and make sure all students are heard/seen/best supported. I understand that many teachers don’t have flexibility in the classroom (and certainly don’t have another adult in the room regularly) so tried to make my tips applicable to all kinds of co-teaching and collaboration set ups. Even if you don’t get to work concurrently with another teacher, you can still collaborate (and share resources, notes, ideas, and more) with other teachers or professionals in the building and this year, you might be working with push in aids, teaching assistants, or special educators. Try something new or unexpected and BE FLEXIBLE. Some of the greatest cooperation comes from unanticipated sources. We’ve worked to integrate our curriculum with the Art teacher at our school and were amazed at how the visual support took our students’ geographic understanding to a new level. We also did an amazing service learning project that never would have been possible without Homeroom and Art teachers working together. Our students’ feedback to us reflected the values of these partnerships as they reflected that they enjoyed integration across disciplines immensely. However, trying something new is hard. Know that it may not go as expected and be okay with that! Know that you won’t be totally in control and be okay with that, too. Be clear and open. I’ve heard the statement, “Co-teaching is like a marriage.” many times. Whether or not you agree with this comparison, it is true that clear expectations and open communication can make all the difference. You and your co-teacher (or anyone you are collaborating with) have to make joint decisions, issue joint communication, share labor, and (hopefully) support each other. The same conflict resolution strategies we teach our students apply to us as well: be respectful (of both yourself and others), try to use kind words when possible, and be clear about what you need (or would like) to happen next. Define responsibilities and roles: who will be in charge of what? What will you do together? How will this work? Make sure you have some time to plan and debrief together. If you don’t have time to sit down together frequently (because you’re a teacher with an extremely long to do list), use shared documents (Google docs are free to use and there are many other resources out there) so you both (or all) are on the same page. Show gratitude and respect. I’m so grateful to have someone else in the room with me. It makes so much possible, makes me a better teacher, and allows me to try out simulations and new activities that would require a lot more coordination (or simply be logistically flawed) with one teacher. I make it clear to my students that all teachers have equal authority - it’s not “my classroom,” it’s “our classroom and our school” and we all work together and are essential parts of the community. Enjoy your sense of humor. I know you have one because you’re a teacher! There are so many hilarious things that happen in classroom all the time and it’s wonderful to have another adult present to share the amusement. Also, innovation often means trying something many times before having success! You are trying something new so it might not go as expected. 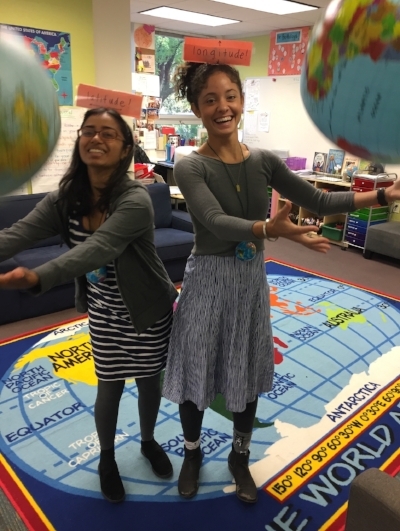 Laughing at yourself (and each other) in a kind way is also wonderful modeling for students. It’s a great way to show them that you took a risk, tried something out, and understand that mistakes are part of learning and life. I hope these tips are useful for you to think about before you head back to school! Stay tuned for updates about rolling out my co-teaching facilitator work with other teachers. I’ll try to remember to be flexible and have a sense of humor!